RM1712-NAS 12-Bay 1U Rack mount SAS/SATA 6Gb/s SSD/HDD NAS Server RAID Levels 0, 1(Disk Mirror), 5, 10 and JBOD , 1 x 10GbE, 2x Gigabit NIC, plus IPMI Lan, 400W P/S, Swappable HDD Trays. Hot-spare drive support with automatic rebuild. Hot-swap drive for easy replacement GUI RAID Manager software + NAS management support. 115/240V AC power OR Optional 48VDC /72V DC or 110V DC power supply. RM1704-NAS 4-Bay 1U Rack mount SATA RAID Levels 0, 1(Disk Mirror), 5, 10 and JBOD , 2x Gigabit NIC, plus IPMI Lan, 400W P/S, Swappable HDD Trays. Hot-spare drive support with automatic rebuild. Hot-swap drive for easy replacement GUI RAID Manager software + NAS management support. 115/240V AC power OR Optional 48VDC /72V DC or 110V DC power supply. RM1701-m is a High performance MIL-STD-810G ruggedized, Intel Xeon NAS Server system built for Mission-critical applications in Military or Heavy- Industrial environment. The RM1701-M server is designed to provide unparalleled performance, delivering outstanding performance for mission-critical applications in harsh environments. Enterprise Server series, All Linux O/S and UNIX O/S variants and derivative. NAS2400 4-Bay 1U Rack mount NAS Server SATA RAID Levels 0, 1(mirror), 5, 10 and JBOD , Gigabit NIC, 400W P/S, Swappable HDD Trays. Hot-spare drive support with automatic rebuild. Hot-swap drive for easy replacement GUI RAID Manager software + NAS management support. Standard 115V/240V AC power supply. NAS2600 6-Bay 2U Rack mount SATA RAID Levels 0, 1(Disk Mirror), 5, 10 and JBOD 500W P/S, Swappable HDD Trays, Gigabit NIC. Hot-swap and hot-spare support, Dynamic sector repair, S.M.A.R.T disk drive monitoring Hot-spare drive support with automatic rebuild. Hot-swap drive for easy replacement. GUI RAID software + NAS management support. ALL RS-20016 series ships with THUNDERBOLT 3 40Gbits/s ports. Search no further for efficient NAS solution for your project. Model RS-20016KM6 2U SSD rugged Industrial/Military NAS solution meets your applications requirements. 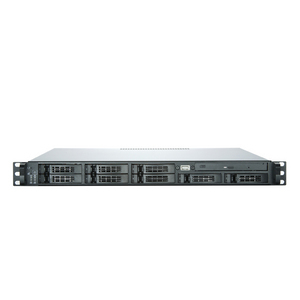 RX-20016KMX series was originally designed for HPC (High Performance Computing) Mission-Critical applications and environments using SAS 3.0 drives and host interfaces operating @ 12Gb/s, high Bandwidth, high bus speed and backplanes, and later improved for 4K/8K high-speed video work flow and real-time content streaming. Now with its massive large data pipeline, almost any applications and usage is appropriate for these quantum blazing speed innovative NAS solution. 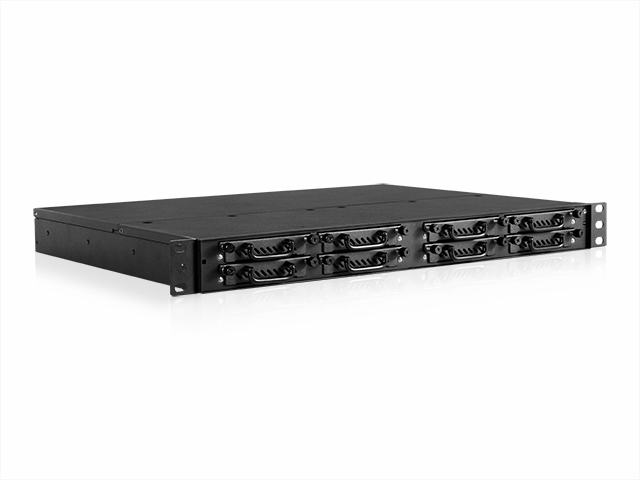 RS-20016KM6 has been upgraded to use Samsung's PM1633a SAS 3.0 12 Gb/s SSD drives attached to 12Gb/s raid controller streaming Data Transfer rate up to 1200 MB/s (1.2Gb/s) for each port or connection. This is twice as fast as standard 6 Gb/s SAS/SATA SSD drives. Paired with the system's PCIe 3.0 mezzanine bus speed, delivering performance speed is up to 8000 MB/s (8.0 Gb/s), thus ensuring sustainable consistent high data transfer rate. RX-20016KMX and 30016KMX SAS 3.0 SSD disks has up to 900 MB/s sequential write speed, and pairing or combining the systems 6 x qty 16TB SAS 3.0 SSD disks into a raid 0 produces up to 5.4 Gb/s sustainable write speed. 12 GB/s SAS/SATA features End Device Frame Buffering, allowing more devices to work in parallel, hence preventing Data Saturation of each connection link unlike 6 Gb/s or 3.0 Gb/s SSD disk links, however the system bus and backplanes must be able to support 12 Gb/s and 1200 MB/s (1.2Gb/s) data rate for each connection link. 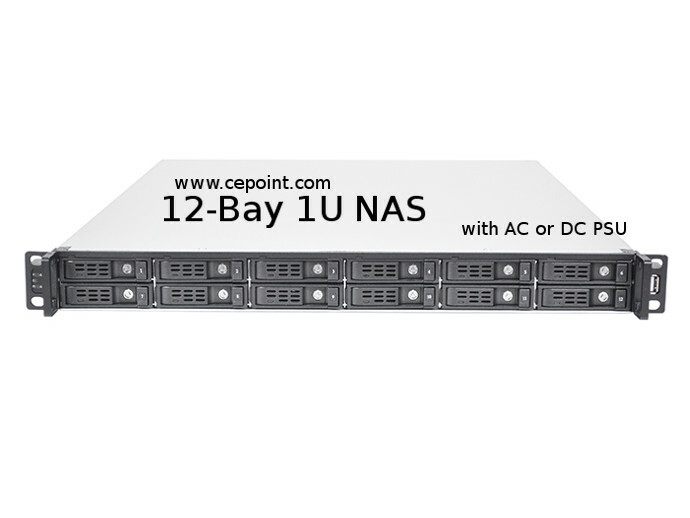 This high performance features and other design features of Cepoint's SSD Industrial/Military NAS solution are what differentiates RX-20016KMX and 30016KMX series from competitors. Using the systems optional single or dual port 40 GbE Network SFP+ Adapter or Quad port 10GbE Network SFP+ Adapter, data pipeline can make a huge difference in large amount of data transfer in real-time or Near-Real Time. RX-20016KMX and 30016KMX series incorporates optional dual port 40GbE copper or optical 40GbE or 10GbE SFP+ network adapter for huge data transfer over network, transferring data up to 5.0 GB/s depending on factory configuration and user options. 1) Prices listed are OEM pricing only for systems integrators and authorized resellers. Educational institutions, Hospitals, Schools and universities may qualify for OEM pricing. 3) *** JBOD bare chassis does not come with Controllers, software or cables. JBOD bare chassis or enclosures only comes with enclosure, power supply and drive trays (EFFECTIVE JANUARY 15 2004, CEPOINT NO LONGER SHIPS BARE JBOD’s. ONLY FULLY CONFIGURED RAID SERVERS WILL BE SHIPPED. ©2004.Cepoint Networks, LLC. All rights reserved. Cepoint, Cepoint Networks, R-STOR™ are trade names or trademarks of Cepoint Networks, LLC. All other trade marks are properties of their respective owners. For more information Contact: sales@cepoint.com Phone: (603)883-7979 Website: http://www.cepoint.com Cepoint storage array sub-systems are manufactured and tested with the best industrial parts and components that have been subjected to the highest quality process in the industry. Pictures or photos shown are for illustration purposes only, and does not necessarily show the actual colors or exact product(s). Specifications may be subject to change without notice. Prices listed are OEM pricing only for systems integrators and authorized resellers. Cepoint reserves the right to review its pricing without prior notice. All sales are final. 50% deposit and balance COD for established and approved accounts. ALL new Accounts requires Prepayment by T/T, EFT (Electronic Fund Transfer)/Wire Transfer, Money order, Certified bank check or company check (US based companies only). International orders T/T or EFT only. Systems are warranted for 3-years. Disk Drive warranties are 3-years, except as may be specified by the drive manufacturer. Cepoint will replace or repair defective or DOA units with an authorized RMA. Cepoint Networks, LLC. warrants that the product(s) that it manufactures and sells will be free from defects in materials and workmanship for a period of one (1) year from the date of shipment. If a product proves defective during this warranty period, Cepoint Networks, at its option or discretion, either will repair the defective product without charge for parts and labor, or will provide a replacement in exchange for the defective product(s). ALL SALES ARE FINAL AND CEPOINT WILL NOT ACCEPT RETURNS WITHOUT WRITTEN CONSENT OF THE COMPANY. In order to obtain service under this warranty, Customer must notify Cepoint of the defect before expiration of the warranty period and make suitable arrangement for the performance of service. Customer shall be responsible for packaging and shipping the defective product(s) to the service center designated by Cepoint, with shipping charges prepaid. Cepoint shall pay for return of the product to customer if the shipment is to location within the country in which Cepoint Networks service center is located. Customer shall be responsible for paying all shipping charges, duties, taxes, and any other charges for products returned to any other location(s). This warranty shall not apply to any alteration, defect, failure or damage caused by improper use or improper or inadequate maintenance and care. Cepoint shall not be obligated to furnish service under this warranty a) to repair damage resulting from attempts by personnel other than Cepoint representative to install, repair or service the product; b) to repair damage resulting from improper use or connection to incompatible equipment; c) to repair any damage or malfunction caused by customer’s actions or attempts to modify the product(s). (c) 2018 Cepoint Networks, LLC.